Larger and jumbo x-ray images (more). which are much brighter in X-ray wavelengths. The distance of Castor, or Alpha Geminorum, from Sol was estimated by the HIPPARCOS mission to be about 51.6 light-years (ly) using a space-based parallax (Plx=0.06327, e_Plx= +/- 0.00123). On the other hand, the Yale Parallax Catalogue suggests a distance of 43.7 ly. However, it has about twice the acknowledged error based on an average of Earth-based observations. Given the past difficulty of obtaining good Earth-based parallaxes noted in the literature and for the sake of simplicity, most new calculations presented here will use the farther HIPPARCOS distance estimate. observed to flare (larger x-ray images). 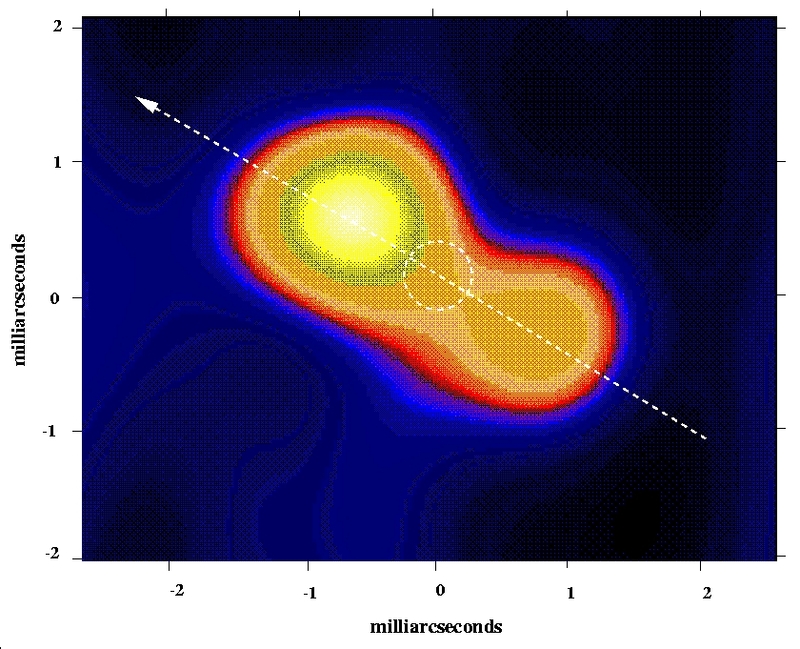 Broadband and frequent x-ray flares and quiescent x-ray flux in both the inner bright stars Aab and Bab pairs as well as the outer pair of flare stars Cab, or YY Geminorum AB, have been repeatedly observed (Güdel et al, 2001; Gotthelf et al, 1994; Schmitt et al, 1994; and Pallavicini et al, 1990). The flares are believed to evolve in minutes to hours from magnetic instabilities in hot outer stellar atmospheres. While this was theoretically and observational anticipated for young red dwarfs, it was not expected for A-type dwarfs. Hence, the recent detection presence of flares from the Aab and Bab systems has led to debates over the actual spectral type of their companions and the magnetic stability of young A dwarfs since ROSAT had unexpectedly observed X-ray emission from early A-type dwarf stars with post-T Tauri companions. The Castor system (especially YY Gem) was also found to be relatively bright in radio, microwave, and some infrared wavelengths detected by IRAS (Freidemann et al, 1996). Over the coming decades, the two optically brighter binary pairs Castor Aab and Bab will move further apart in angular distance which will make it easier to redetermine their spectral types and masses. Castor Aa is a main sequence dwarf bluish-white star of spectral and luminosity type A1 V. Given its shared spectral type with well known neighbor Sirius A, Star Aa probably has a similar mass around 2.15 Solar. It may also have around 2.3 times Sol's diameter and 17 to 34 times its visual luminosity or more (depending on whether its unseen companion is an A-type dwarf). All the stars in this system may be less enriched than Sol (Güdel et al, 2001) -- despite being more enriched than Vega -- with elements heavier than hydrogen ("metallicity") based on its abundance of iron (Cayrel de Strobel et al, 1991, pp. 286 and 303). 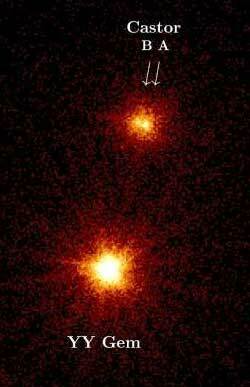 The star has a single-lined, spectroscopic stellar companion Ab. Useful catalogue numbers and designations for the star include: Alp or Alf Gem A, 66 Gem A, HR 2891*, Gl 278 A, Hip 36850, HD 60179, BD+32 1581, LTT 12038, WDS 07346+3153 A, ADS 6175 A, and Struve 1110 A. Stars Aa and Ab have a combined luminosity of over 34 times that of Sol's. They are separated on average by only 0.022 AUs (of a semi-major axis). Their highly eccentric orbit (e= 0.499) takes only 9.21 days to complete (Joel Stebbins, 1914, pp. 465-466; and Heber D. Curtis, 1906). Currently, the circumbinary orbit of an Earth-like planet (with liquid water) around Stars Aab may be centered just beyond 6.0 AU -- just outside the orbital distance of Jupiter in the Solar System. Astronomers would find it very difficult to detect an Earth-type planet in the water zone of any star in this system using present methods. of Sirius A to Altair. 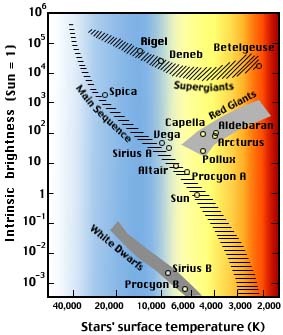 Castor Ab is a main sequence dwarf of uncertain spectral type, probably ranging from M5 to brighter ("earlier") type of probable luminosity type V (Golub et al, 1983). Its mass probably ranges from 40 to 60 percent or more of Sol's, with a diameter and luminosity less than Sol's (if not an A type dwarf. 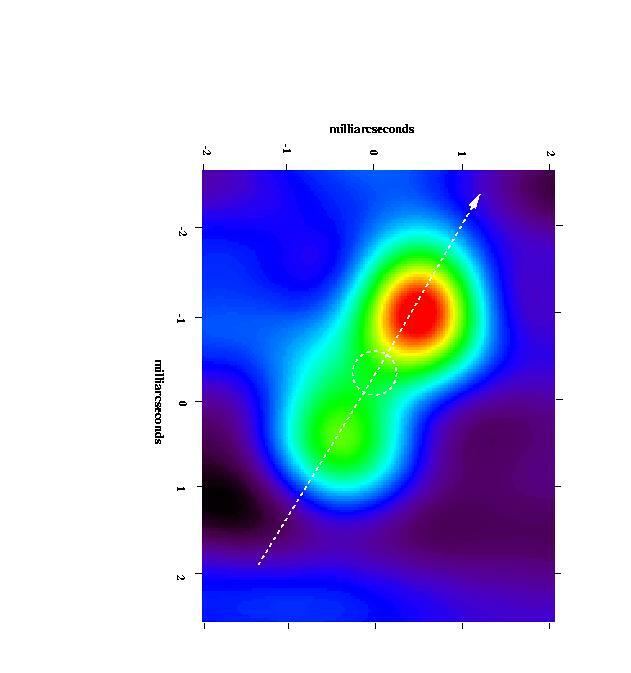 Based on EXOSAT observations, this object is believed to be a relatively bright, quiescent x-ray source that emits broadband flares and frequent x-ray flares (Güdel et al, 2001; Gotthelf et al, 1994; Schmitt et al, 1994; and Pallavicini et al, 1990). Such unexpected, X-ray emission has been observed with early type and post-T Tauri A dwarf companions with ROSAT. Useful catalogue numbers and designations for the star include: Struve 1110 C and ADS 6175 C.
Castor Ba is a bluish-white main sequence dwarf star of spectral and luminosity type A2-5 Vm. Other than the metallic lines in its spectra, the star appears similar to Fomalhaut. Star Ba has an estimated mass around 1.7 times Sol's, 1.6 times its diameter, and over 14 times its visual luminosity. The star has a single-lined, spectroscopic stellar companion Bb, and frequent x-ray flaring from the binary system has been observed (Güdel et al, 2001). Useful catalogue numbers and designations for the star include: Alp or Alf Gem B, 66 Gem B, HR 2890*, Gl 278 B, HD 60178, SAO 60198, FK5 287, WDS 07346+3153 B, ADS 6175 B, and Struve 1110 B.
Castor Bb is a main sequence dwarf star of uncertain spectral type, probably ranging from M2 to a brighter type ("earlier") -- possibly with metallic lines as well -- and luminosity type V (Golub et al, 1983). Its mass probably ranges from 40 to 60 percent or more of Sol's, with a diameter and luminosity less than Sol's. Observations with the XMM-Newton detected flares coming from the Bab system, possibly from this unseen companion Bb. Castor Ca is a red main sequence dwarf star of spectral and luminosity type M0.5 Ve. It has an estimated mass around 62 percent of Sol's, 76 percent of its diameter, (Schmitt et al, 1994; from Joy and Sanford, 1926) and 2.6 percent of its visual luminosity. The star has an eclipsing, spectroscopic stellar companion Cb. Both are considered to be flare stars with frequent emission of x-ray flares and so have been given the variable designation YY Geminorum. Useful catalogue numbers and designations for the star include: Alp or Alf Gem C, 66 Gem C, YY Gem, Gl 278 C, and BD+32 1582. -- high resolution and jumbo images (Benz et al, 1998). young UV Ceti (Luyten 726-8 B) shown flaring at left. suddenly again after several hours. Castor Cb is a red main sequence dwarf star of spectral and luminosity type M0.5 Ve. It has an estimated mass around 57 percent of Sol's, 68 percent of its diameter, (Schmitt et al, 1994; from Joy and Sanford, 1926) and 2.6 percent of its visual luminosity. Many dim, red (M) dwarf stars exhibit unusually violent flare activity for their size and brightness. These flare stars are actually common because red dwarfs make up more than half of all stars in our galaxy. Although flares do occur on our Sun every so often, the amount of energy released in a solar flare is small compared to the total amount of energy that Sol produces. However, a flare the size of a solar flare occurring on a red dwarf star (Castor Cab) that is more than ten thousand times dimmer than our Sun would emit about as much or more light as the red dwarf does normally. Flare stars erupt sporadically, with successive flares spaced anywhere from an hour to a few days apart. A flare only takes a few minutes to reach peak brightness, and more than one flare can occur at a time. Moreover, in addition to bursts of light and radio waves, flares on dim red dwarfs may emit up to 10,000 times as many X-rays as a comparably-sized solar flare on our own Sun, and so flares would be lethal to Earth-type life on planets near the flare star. Hence, Earth-type life around flare stars may be unlikely because their planets must be located very close to dim red dwarfs to be warmed sufficiently by star light to have liquid water (around 0.23 AU for Castor Cab), which makes flares even more dangerous around such stars. In any case, the light emitted by red dwarfs may be too red in color for Earth-type plant life to perform photosynthesis efficiently. The following table includes all star systems known to be located within 10 light-years (ly), plus more bright stars within 10 to 20 ly, of Castor. * plus bright stars * . . . Try Professor Jim Kaler's Stars site for other information about Castor at the University of Illinois' Department of Astronomy. Up-to-date technical summaries on this star can be found at: the Astronomiches Rechen-Institut at Heidelberg's ARICNS Star Pair A, Star Pair B, and Star Pair C; and the Nearby Stars Database. Additional information may be available at Roger Wilcox's Internet Stellar Database and Alcyone Software's Castor. Constellation Gemini, the Twins, is the northernmost of the zodiacal constellations and among the brightest. In Greek mythology, Zeus (the chief of the gods) seduced Leda (the wife of the King of Sparta, Tyndareos) on her wedding night by changing himself into a swan. In time, Leda gave birth to the twin boys immortal Pollux (by Zeus) and mortal Castor (by Tyndareos), and to a girl named Helena who became Queen of Sparta and was abducted by Paris to Troy which led to the Trojan War. The twins, on the other hand, sailed with Jason in the quest for the Golden Fleece; during a storm, they helped save their ship ARGO from sinking, and so the constellation became much valued by sailors. For more information about the stars and objects in this constellation and an illustration, go to Christine Kronberg's Gemini. For an illustration, see David Haworth's Gemini. For more information about stars including spectral and luminosity class codes, go to ChView's webpage on The Stars of the Milky Way. © 1998-2002 Sol Company. All Rights Reserved.